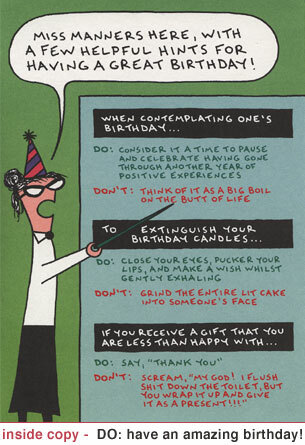 GC002 - Miss Manners B-day Card: Out of print greeting card featuring the S word, OH THE VULGARITY! Needless to say, don’t give this to a member of the clergy, or toddler. DO order a bunch at the LOW LOW price of $1.95 a card.